2.i) What was the main. objective of Lucknow Pact? Lucknow pact proved to be the beacon light on the political horizon of India. If this sense of co-operation have been carried out the atmosphere of understanding and co-operation generated but Hindu did not honestly stick to these principles instead of it mistrust, hatred and non-cooperation carried into political life. It was important milestone in the history of sub-continent, due to this agreement congress gave protection to all due rights of Muslims and Muslim League induding the right of separate electorate. ii) Write a note on any one Regional Language of Pakistan. Sindhi is one of the important regional language of Pakistan. It appears that Sindhi was spoken in the Indus Delta from time immemorial. It is said that the language of the people of Moen-jo-Daro contained elements of present era Sindhi language. The origin of this language is not exactly known. However, travelers like AI-Beruni have told us about the original script of the language. Chach Nama is an authentic document that proves that the dialect of Sindhi language was the same in the 12th century, as it is today. iii) What are the important Natural Resources of Pakistan? OR State any Five Agricultural Problems of Pakistan. 1) Soil Erosion: The productive capacity of a soil is often related to the properties inherent without soil. Erosion removes top-soil and exposes sub-soil, thereby changing its characteristic productivity. Removal of soil by erosion and subsequent incorporatior’t of underlying material by tillage reduces the organic matter. Rain .and other natural agents like wind storm, snowfall and earthquakes cause soil erosion. They remove the fertile upper crust partie/es of earth. This result in low yield of crops. million hectdres,21 million hectares is cultivable. Of the total cropped areas 16.2 million hectares (77%) is irrigated and 6.01 million hectares is rain-fed. The annual rainfall in Pakistan varies from less than 100 mm in Sindh to more than 750 mm in the foothills and northern mountains. About 60% of this rainfall occurs during monsoon. In spite . of a number of drainage and salinity, menace control schemes being undertaken, the salinity and water logging problems positively persist and each year 40,000 hectares of irrigated land is lost to water logging and salinity. On the one hand, the nation needs more food to fulfill the demands of its increasing population while on the other hand, each year the cultivable commanded area (CCA) is decreasing due to this twin menace. 4) Small Land Holdings: Small land holding occur due to growth in population, increase in the number of farmers, law of inheritance and selfish attitudes of big land lords. As a result, mechanized farming cannot be adopted on small land holding and no increase in the agricultural production is possible. 5) Lack of Irrigation Facilities: The sources of irrigation in Pakistan include wells, canals, kareez, ponds and rivers. The facilities of irrigation are not available according to the need of the farmers. Dams and barrages should be built to solve this problem so that land all over Pakistan can be provided by water for irrigation and the area under cultivation may be expanded. iv) Write any Five Islamic provisions of the 1973 constitution. The Iollowing; are the Islamic provisions of 1973 constitution based on the principles of Holy Quran and Sunnah. 3. Sover~ignty Belongs to Allah: Sovereignty over the entire Universe belongs to Almighty Allah and the authority bestowed by him on men is a sacred trust which the people of Pakistan will exercise with the limits prescribed by Quran and Sunnah. a Muslim. A person who believes in Tauheed or Oneness of Allah and in the absolute and unqualified finality of Uie prophethood of Hazrat Mohammad (P.B.U.H) as the last prophet of Allah has described as a Muslim. v) State any Five basic principles of the Foreign Policy of Pakistan. vi) Explain the Two Nation Theory. OR State the Geographical importance of Pakistan. vii) Describe the objectives of Khilafat Movement. The Khilafat movement was a religio-political movement launched by the Muslims of British India for the retention of the Ottoman Caliphate and for not handing over the control of Muslim holy places to non-Muslirr.s. It was a peak period from 1919 to 1922 casting demonstrations, boycott, and other pressure by the two major communities, the Hindus and the Muslims. Being brothers, the Indian Muslims realized their religious duty to help the Muslim country. It was the extra territorial attachments based on Islam. Another factor same to the first was that the Indian Muslims considered Ottoman Caliphate a symbol of unity ot” the Muslim world as Ummah. This Movement was launched with the following goal. 1. Ottoman Khilafat should be kept intact. 2. Territorial solidarity of Turkey be preserved. viii) Write about the importance of Urdu language for Pakistan. Describe important political events occurring during 1940 to 1947 in the sub-continent. 1940-The Pakistan Resolution: It is a landmark in the history of the Indian Muslims. The Pakistan Resolution was passed in March 1940 at the Muslim League session at Lahore under the president ship of Quaid-e-Azam Muhammad Ali Jinnah. The resolution demanded that the Muslim majority areas be grouped to constitute independent states. Pakistan was the direct outcome of this resolution. 1942-Cripps Mission: Sir Stafford Cripps arrived in New Delhi for talks with Indian Leaders on the future constitution of India. He discussed the draft proposals. The Muslim League rejected the proposals as there was no provision for amendments or for the formation of two constituent assemblies instead of one. 1944- Gandhi – Jinnah Talks: Gandhi – Jinnah talks were held at Bombay en the basis of the Rajagopaiachari formula to resolve the differences between the Congress and the All India Muslim League on the issue of Pakistan. Gandhi was opposed to the Two Nations fheory and refused the Muslims the right of self-determination. These talks failed. Simla where the formation of an Executive Council was discussed. The Congress insisted that it represented all the communities in India and could nominate Muslims to the new Council. The All India Muslim League stated that only the League had the right to nominate Muslim members. The Conference failed on this issue. 1946-The Cabinet Mission: The Cabinet Mission proposals stipulated a weak Centre, supreme only in foreign affairs, detejice and communication, and three autonomous groups of provinces. Two of these were to have Muslim majorities while the third one was to have a Hindu majority. The Muslim League accepted the Plan but the \ Conqress gave a qualified consent. Nehru’s defiant posture and refusal to accept the groupings and a less powerful centre angered the Quaid, who later rejected the Plan. 1946-Direct Action Day: Disgusted with the Congress stance vis-a-vis the Cabinet Mission Plan, the Quaid voted for observing Direct Action Day on August 16, to press for Pakistan. For the first time in its annals, the League said good-bye to constitutional struggle for achieving their goal. 1946-lnterim Government Installed in Office: The British Government proposed on 22 July that an Interim Government be formed at the Centre. Initially both the Congress and the Muslim League rejected the proposal. The Viceroy then asked only Nehru to from the governmef1t. The Muslim League regretted the installation of a one-party government and flew black flags. It later realized that its exclusion from the government was playing havoc with Muslim interests. Finally after long and complicated negotiations the League joined the government Liaquat Ali Khan was given the Finance portfolio. Congress was to regret this decision. orepared by Lord Mounibatten ‘he iast Viceroy of India, in consultation vith the British government .’ .vas based on the fundamental principle .’l~t’transfer of power should take place according to the wishes of the ~ -ople. A time-limit for British withdrawal from the subcontinent was f xed. The British decided to hard over power on 15 August 1947 to two successor states to be known as India and Pakistan. .
1947-Pakistan Achieved: 14 Augus11947 was Pakistan’s date with destiny. On that day, Mountbatten. formally transferred power to the Constituent Assembly of Pakistan on behalf of His Majesty’s Government. On 15 August Quaid-e-Azam Muhammad Ali Jinnah was sworn in as the first Governor General of Pakistan. A seven-year old struggle came triumphantly to an end and a long cherished dream stood translated into reality. 4. Describe the Ideology of Pakistan, in the light of Quaid-e-Azam’s statements. From the above statement, it is clear that Ideology of Pakistan is an Islamic one. Elements of Ideology of Pakistan: Hindus and Muslims belong to two different religious philosophers, social customs, and literatures. They belong to two different civilizations which are based mainly on conflicting ideas and conceptions. Tberefore, Muslim nation demanded a separate homeland where they could have the freedom to practice their religion and live their lives as free individuals of an independent country. There are five principles/elements of the ideological foundation of Pakistan. Ideology of Pakistan and Quaid-e-Azam: Quaid-e-Azam Mohammad Ali Jinnah, the great leader of Muslims of Sub Continent gave practical shape to the ideology given by Ailama Iqbal. He had a strong believe in Hindu Muslim unity and was of the opinion that both Hindus and Muslims should launch joint efforts to get rid of British rule. After joining Muslim League in 1913, he continued with his efforts to bring about Hindu Muslim unity but he was greatly disappointed to see the prejudicial attitude of the Congress and Hindus towards the Muslims. Follow ”1g are some extracts from the speeches and statements which he delivered from time to time for explaining the ideology of Pakistan. The above sayings and statements largely prove that Quaid-e-Azam wanted an established Islamic system as a code of life because he believed that it was the sole objective of the Pakistan Movement. OR What were the problems faced by Pakistan just after is creation. 1. Choice of Capital and Establishment of Government The first problem that Pakistan had to face was to choose a capital to form a Government and to establish a secretariat, Karachi was chosen as the capital of Pakistan. 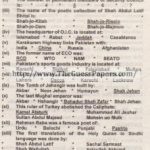 Quaid-e-Azam took the office of the Governor General, Liaqat All Khan was appointed as Prime Minister and a Cabinet of experienced persons was selected. Arrangements were to be made to bring the officials who had opted for Pakistan from Delhi to Karachi. 3. The Massacre of Muslim Refugees in India: On the birth of Pakistan, Hindus and Sikhs became more furious. In a planned move, Muslim properties were set on fire and they were compelled” to leave Bharat for Pakistan with nothing but their lives. Millions of refugees were killed before they reached Pakistan. Many migrants were looted and had to be provided boarding immediately as they reached Pakistan. 4. Division of Military and Financial Assets: In order to embarrass Pakistan financially, India did a lot of dishonesty in the matters of Pakistan which were concerned with its benefits. Pakistan was promised to get Rs.750 million but the Bharat Government refused to give .Pakistan received only 200 million. Pakistan also did not receive the due share of the military assets. This dishonest attitude put Pakistan into great difficulties. 5. Canal Water Dispute: Most of the river flowing in Pakistan have their origin in India. In 1948, India stopped water supply to Pakistani canals to damage the Pakistani agriculture. However on 9th September, 1960 on agreement called “Indus Basin Treaty” was signed between the two countries. 6. Kashmir Dispute: Kashmir dispute is the most important and unsolved problem. Kashmir is the natural part of Pakistan because at the time of partition 85% of the Kashmir’s total population was Muslim. The Hindu Dogra raja, who was secretly with the Government of India declared Kashmir as a part of India. Pakistan has continuously insisted that Kashmir must get their right of self determination but due to non-cooperation of India, Kashmir issue still remain unsolved. 7. Constitutional Problem: The constituent assembly failed to frame it constitution even in eight years. Lack of a permanent constitution created, chances of unscrupulous interference in democratic progress of Pakistan. 8. Annexation. of Princely States: All Indian princely states were given the right to’ link’ up.wjth either of dominions. However, the fate of following states remained-undecided. Junagadh: The Muslim Nawab go’verning Junagadh favored in acceding to Pakistan.” But Indian. Government sent Army troops towards Junagadh and occupied the state by force in November, 1947. Hyderabad Deccan: Hyderabad Deccan was the largest and richest state ruled by Muslim ruler Nizam who decided to remain independent. But pressure tactics begar1 to b~ applied by ‘lndlan Government and Mount Batten .India attacked Hyderabad on 13th September 1948 and forcibly annexed this state to India. 9. Electrcity Problem: Due to transfer of Muslim majority areas to Bharat and unfair demarcation, electricity system of West Punjab was disrupted ,because all power stations were at Mundi, a predominantly Muslim majority area, gifted to Bharat. 5. Explain the salient features of Pakistani Culture. Ans: See on Page # 67.